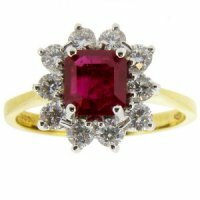 A Traditional Octagon Ruby and Diamond Cluster Ring. 18K. A Diamond and Ruby Ring. A classic ring set with a rectangular Ruby to the centre within a single row surmount of 10 round diamonds. All mounted in a White claw setting to a Yellow shank. The Ruby measures 6x5mm and weighs 1.02cts and the 10 Brilliant Cut diamonds weigh 0.57cts in total. All mounted in 18 carat gold. Hallmarked Ruby Cluster ring. 18k - 750.